Saginaw, Michigan – The Ottawa 67’s (15-3-1-0; 31 pts.) 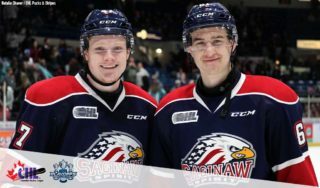 are the youngest franchise in the OHL with just one overager in former Saginaw Spirit (8-6-1-1; 18 pts.) first-round selection Tye Felhaber, who entered Sunday’s contest against his aforementioned club with 18 goals in his previous 18 games. Felhaber, who was drafted 10th overall in 2014 and played two full seasons for Saginaw, earned his 19th at the 3:04 mark of the first period, giving the Spirit their third loss this season at The Dow Event Center in the 8-2 decision. Despite a disadvantage in experience, Ottawa didn’t show its age as the OHL Eastern Conference leader, scoring six goals in the first period on 12 shots. 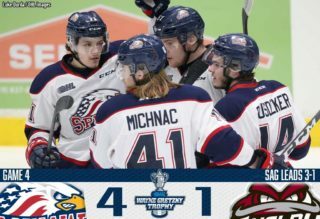 The Spirit were coming off Saturday’s 5-4 comeback win over the Guelph Storm in which goaltender Ivan Prosvetov recorded six straight saves in the shootout. Prosvetov, who collected his sixth win of the season after making 18 saves, was pulled for third-year veteran Cameron Lamour once the 67’s notched their fourth goal on six shot attempts, when Felhaber collected his 12th assist for 31 points with 11:23 remaining in the opening frame. Saturday was Lamour’s second relief appearance in eight days, making the start in the 5-3 loss on the road to divisional rival Sarnia Sting. The former third-round selection in 2016 began the second period with five saves. Ottawa went on the board at 17:44 into the first on their first shot attempt. Unable to secure the clearing puck, Prosetov faced a charging Austin Keating, who scored his seventh of the season in front of the crease. Three minutes later, the Spirit trailed by two as Quinn Yule’s shot ricocheted off the boards to the stick of New Jersey Devils prospect Mitchell Hoelscher, hitting a wide-opened net before Prosvetov could react. 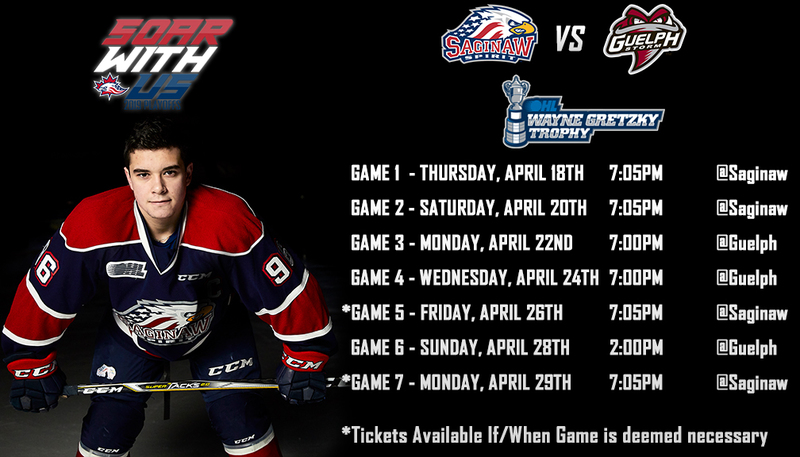 Saginaw went on their first penalty kill with 5:57 remaining forward Sam Bitten scored his first goal in 40 games. Bitten’s shot would hit overage defenseman Reagan O’Grady’s skate for the only power play goal this evening for Ottawa. The Spirit nearly broke the scoring run at 8:13 when second-year forward Nicholas Porco rifled a shot to cause Ottawa goaltender Cedrick Andree to fall directly into the net. 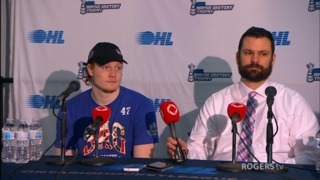 Andree made 35 saves and leads all OHL goaltenders with 13 wins. San Jose Sharks prospect Sasha Chmelevski scored his sixth goal this season and first on Lamour as the Spirit trailed 5-0 with 3:22 remaining before the second period. The goal came a minute after Saginaw killed the second power play for the 67’s. The Spirit got on the board in the second period as Nicholas Porco fired a slap shot off the right pad of Cedrick Andree. In waiting, 2018 New York Islanders second round draft choice Blade Jenkins broke the 30:52 scoreless run for his fourth goal and second in back-to-back games. The Jackson, Michigan native is tied with captain Damien Giroux and rookie Cole Perfetti at 12 points, three-of-eight Saginaw players to possess double-digit scoring. Overage forward Albert Michnac leads the team with 22 points followed by right-winger Cole Coskey at 18. Jenkins’ goal came 19 seconds after Ottawa maintained a 7-0 lead from the ninth scored goal this season by Graeme Clark on a breakaway. The 67’s had a goal erased earlier in the period when Lamour was forcibly pushed into the net during a struggle inside the crease. Both teams would exchange goals in the final seven minutes of the third period. Spirit defenseman Hayden Davis would grab his first goal of the season with assists from defenseman Mason Millman, who scored the game-winning goal in the shootout against Guelph, and captain Damien Giroux at 6:58 to make it 7-2. Holescher completed the multi-goal outing shortly with 3:15 remaining before Ottawa pulled Andree for 18-year-old J.P. Tourigny, who made his OHL season debut, as Saginaw remains in fifth place in the Western Conference standings. 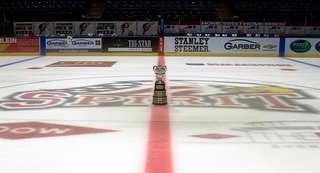 The Spirit won the face-off battle, 41-25, killing three penalties and totaling 37 shots compared to 31 for the 67’s. The Spirit continue their four-game home stand this Friday, Nov. 9, hosting the Mississauga Steelheads for Covenant Fights Cancer Night. Saturday, Nov. 10, is Military Appreciation Night presented by Bay City Elks Lodge 88 as Saginaw will play its second game from The Dow Event Center against OHL Western Conference leader Soo Greyhounds.